As part of Place Weekend, Essex Book Festival welcomes award winning JaJaJa Books, children’s bilingual publisher, who will have a stall in the foyer of firstsite. Genevieve Yusuf started ‘JaJaJa Books’ in 2010 after being a private Spanish tutor for many years. 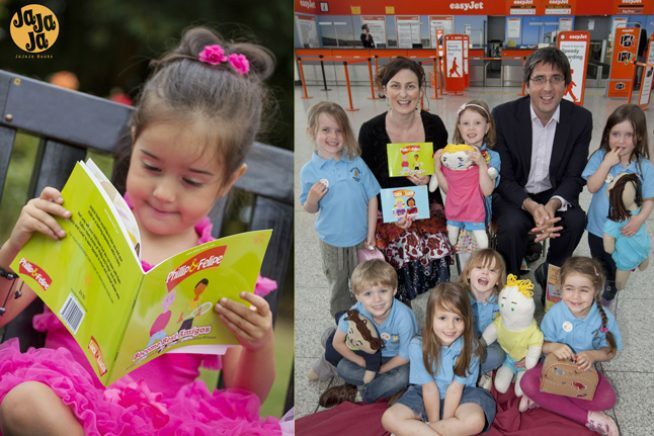 She wanted to create bilingual books with a difference to make language learning fun. She therefore wrote English stories with Spanish words slipped into the context, so that children and parents could learn together through an enjoyable story. After winning awards with Jacqueline Gold, having her Lucy and Lucia audio story put on British Airways and receiving recommendations in the TES, Guardian and parenting columns, she went on to write similar French stories. More recently she has published ‘Ranvir Cannot Hear‘ which is a wonderful tale of inclusion and empowerment and it includes the BSL (British Sign Language) alphabet to learn! This book has been incredibly successful and has raised enough money to support a child for a year at the Rangammal school in India, for children with a hearing impairment.